Braz B Q Truck Brings Brazilian Churrasco To Philly Streets. Brazilian BBQ in Philly. So, Philly’s first Brazilian food truck is now rolling through the streets, outfitted with a custom rotisserie grill – a churrasco – imported from Brazil. But we haven’t had an opportunity to try it yet! But, the response from those who have has been good. So we caught up with owner Adriano Redante for a quick Q&A on what to expect (and the description of that amazing-looking sandwich above). Zagat: Are you from Brazil? Yes, originally from Brazil. I came to the US in 2000; I currently live in Morrisville, PA.
Zagat: What’s your background in food? How did you get the idea for this truck? AR: I cooked on the line in Peddler’s Village for over nine years, and then recently I went to work as a gaucho in a Brazilian steakhouse. Then last year, a friend commented on the lack of a Brazilian truck in Philly, so I decided to do something about that. Zagat: What kinds of food are you serving from the truck, and what’s the price point? AR: Mostly, sandwiches made with meats sliced right off the skewer, but on the rotisserie grill. We had to adapt it to get it to fit in the truck, but it works great now. Prices range from $2.50 for a taco to $8 for the Hamburgão, my signature dish. 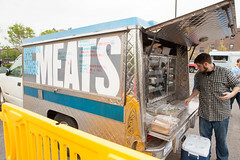 Braz B Q Truck Brings Brazilian Churrasco to Philly Streets.